Byron Womack - STEER FOR STUDENT ATHLETES INC.
Byron Womack, son of Willie and Shirley Womack is the youngest of his three siblings. The family was raised in South Windsor, CT, and from an early age the importance of being a good person was instilled by his loving parents. Moreover, Byron, and his siblings were encouraged to participate in athletics for the positive impact it had on their character to be part of a team. Byron in particular excelled at athletics and was a member of numerous traveling sport teams throughout his youth. Byron participated in athletics throughout his four years at South Windsor High School. He was a member of the Varsity football team, as well as the Track & Field team. As a senior and captain of the football team, Byron rushed for over1300 yards and scored 24 touchdowns earning a full scholarship to Norfolk State University. ﻿Byron transferred to Iona College as a sophomore where he was named team captain and All-American. He went on to set numerous school records as a running back and an NCAA all-divisions record for kickoff returns for touchdowns in a career (6). ﻿After graduating from Iona College, with a degree in social work, Byron was employed with the Guidance Center’s START program that was housed at Port Chester High School. During his tenure with the START program he had the opportunity to counsel students and coach numerous sport teams. 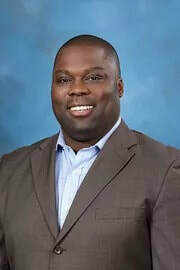 With the desire to gain practical experience and ultimately have full-time employment within a school district, Byron was hired as a college advisor at All Hallows High School, and then onto the Young Women’s Leadership Network, while working as an Assistant Athletic Director at the College of New Rochelle. During this time he also returned to graduate school, earning a Master’s degree in School Guidance and Counseling, which brought him back to the Port Chester-Rye UFSD. ﻿While employed in the Port Chester-Rye UFSD as a School Counselor at Port Chester High School, he completed his second Master’s degree in School Administration and Supervision. He is currently in his third year as Assistant Principal at Port Chester Middle School. ﻿On a professional and philanthropic level, Byron has devoted his life to helping others as a graduate intern supervisor, mentor and coach. As a member of Omega Psi Phi Fraternity, Inc. Omicron Iota chapter, Byron has proudly chaired the scholarship committee for over fourteen years. The focus of this position within the fraternity is to assist young scholars who are in financial need of scholarships to pursue their college education.